After defeating the North Dakota State University Bison in straight sets in the semi-finals, the Coyotes advanced to the finals of the Summit League Tournament to take on the Denver Pioneers. USD split their regular season series against the Pioneers 1-1. 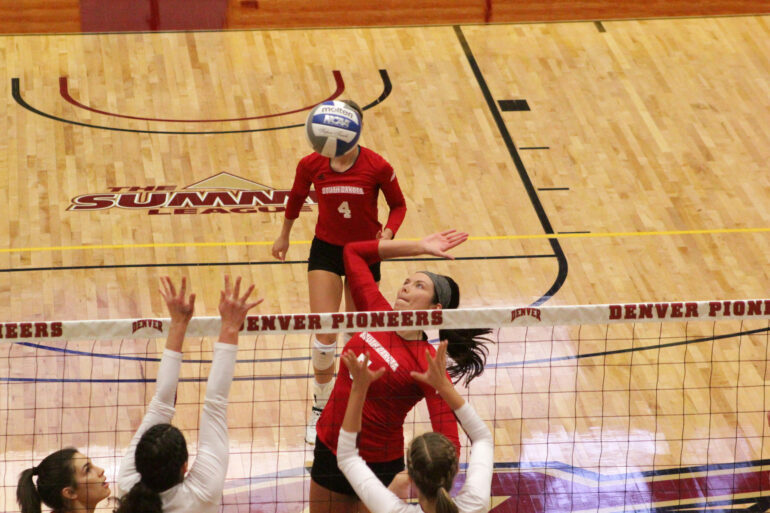 They lost their first meeting in Denver in straight sets, 0-3, but won the rematch in Vermillion 3-2. After the Coyotes struck first and scored the first point, the Pioneers went on an 8-0 run in the first set to put USD in an early hole. Denver would keep USD in that hole as they went on to win the first set 25-12. The second set was another tough one for the Coyotes, as a strong Denver run once again gave them a big deficit. USD was unable to get anything going in the second set as Denver took it 25-14. With their backs against the wall, the Coyotes found life in the third set. An early run from USD helped put the Coyotes in the driver seat as USD would win the third set 25-22 to stay alive and avoid the sweep. One game was all the Coyotes would be able to muster, however, as the Pioneers took the third set 25-18 to win their third-straight Summit League title. For the Coyotes, junior Brittany Jessen led both teams with 39 assists and senior Audrey Reeg led both teams with 15 kills. Both Reeg and sophomore Lauren Mattison were named to the all-tournament team. The Coyotes finished their season at 25-7 overall and 13-3 in conference play, as well as going 10-1 in the new Sanford Coyote Sports Center. This is a much improved finish from their 15-16 mark they posted last year when they went 8-8 in Summit League play.